Pound chicken to 1/2-inch thickness. Season with salt and black pepper. Bring an extra-large skillet sprayed with nonstick spray to medium heat. Cook for about 4 minutes per side, until cooked through. Transfer to a cutting board. Meanwhile, in a large bowl, combine cream cheese with 1/4 tsp. garlic powder and 1/4 tsp. onion powder. Stir until smooth and uniform. Remove skillet from heat; clean, if needed. Re-spray, and bring to medium-high heat. Add mushrooms and bell pepper, and sprinkle with remaining 1/4 tsp. garlic powder and 1/4 tsp. onion powder. Cook and stir until slightly softened and lightly browned, about 6 minutes. Transfer skillet contents to the bowl with the cream cheese mixture. Mix thoroughly. Chop chicken, and evenly place in the baking pan. Evenly top chicken with creamy veggies, marinara sauce, mozzarella, and chopped pepperoni. 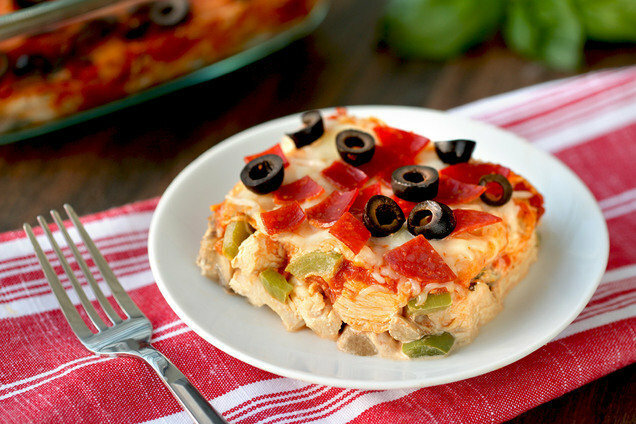 Bake until entire dish is hot and bubbly and mozzarella has melted, 20 - 25 minutes. This recipe is surprisingly simple! BBQ sauce + cheddar + cilantro = MEGA YUM. Pound chicken to 1/2-inch thickness. Season with salt and pepper. Bring an extra-large skillet sprayed with nonstick spray to medium heat. Cook for about 4 minutes per side, until cooked through. Transfer to a cutting board. Remove skillet from heat; clean, if needed. Re-spray, and return to medium heat. Add cauliflower and onion. Cook and stir until mostly softened, 8 - 10 minutes. Transfer to a large bowl. Chop chicken, and add to the large bowl. Add cilantro, garlic powder, 1/2 cup cheddar, and 1/4 cup BBQ sauce. Mix thoroughly. Transfer mixture to the baking pan, and smooth out the top. Top with remaining 1/2 cup BBQ sauce and 1/2 cup cheddar. Bake until entire dish is hot and cheddar topping has melted, 20 - 25 minutes. HG Alternative: Instead of blending 5 cups of roughly chopped cauliflower into rice-sized pieces, use 3 3/4 cups premade cauliflower rice or crumbles, like the kinds by Trader Joe's and Green Giant. 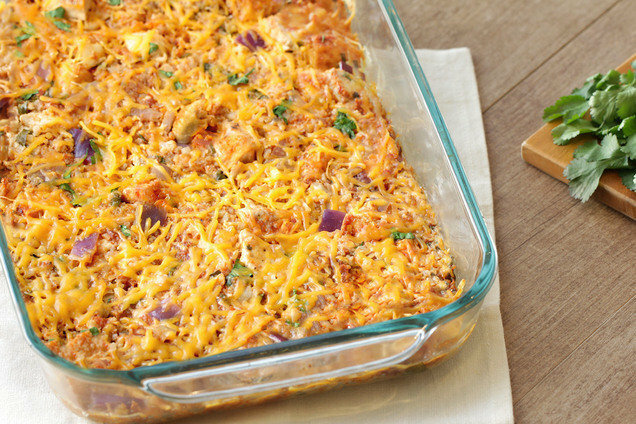 Hungry for More Healthy Casseroles? Help your pals get dinner on the table. Click "Send to a Friend" now!